Reader of the Argus, I have a confession to make. Despite the half dozen or so restaurant reviews I’ve penned in the Features section, I don’t frequently find myself out to dinner on Main Street. It just isn’t feasible for a college student with multiple work-study jobs to eat out quite as often as it may seem I do. Despite that fact, there is one place I’ve been to more than any other—somewhere that keeps calling me back, no matter how hard I try to stay away. It’s a spot I’ve been waiting to write about since I first went there, and finally, in all of its glory, here it is: the Argus review of Brew Bakers. 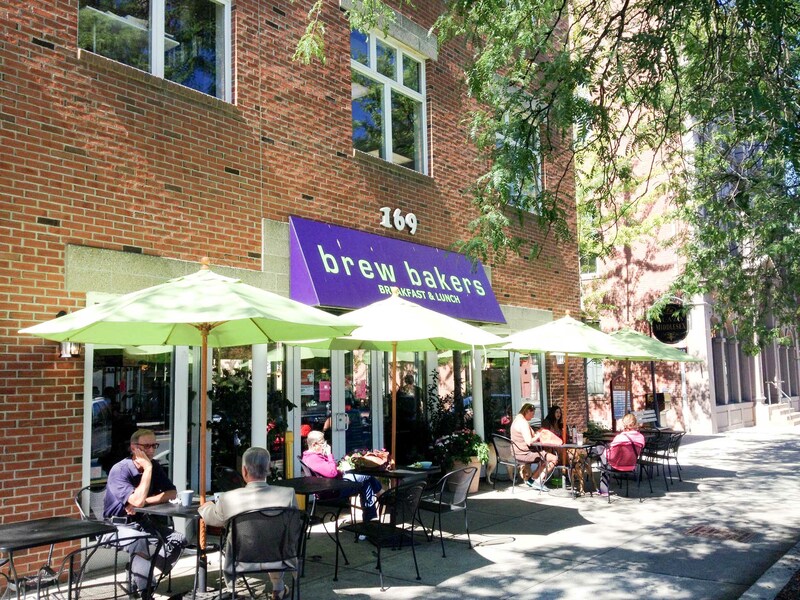 When you walk into Brew Bakers, you’re met with the smell of fresh-baked muffins: the single greatest smell in the history of human existence (this is science, so don’t argue with me). Take a look around, and you’ll see an atmosphere more in line with a European coffee shop (author’s note: I’ve never been to Europe) than a Connecticut restaurant. Beautiful pieces of art, painted by one of the owners, hang on the walls behind small two-person tables. A huge display case with baked goods and desserts may distract you for a second, but your eye is quickly drawn to the sizzling paninis being made and the kitchen behind them. Whatever time of day you visit Brew, you’ll find something for you. There are hot bagels and breakfast sandwiches for you early birds, or sandwiches and salads if you roll out of bed a little bit later. Granted, this is a breakfast and lunch joint, so you’ll have to get there before four on most days in order to enjoy everything they have to offer— even earlier if you’re looking to score some dessert, which tends to sell out pretty early. I know what you’re thinking. “All of these logistics sound nice and all, but tell us about the food!” Well, dear and hungry reader, there’s a reason I can’t manage to stay away from this eatery. Though I haven’t had the chance to try everything on the menu yet, most everything I’ve had so far has exceeded my expectations—with the exception of their breakfast. There are better options on Main Street for the morning. Do yourself a favor and come back for lunch. Do yourself a bigger favor and start with the panini menu. I know that there are tons of options for pseudo-paninis here on campus. And I also know most of you will argue that any combination of melted cheese and crunchy bread will be good, and that there isn’t anything all that special about a panini regardless of where it’s from. I’m here today to tell you (not for the first time) that you are dead wrong. Yes, bread and cheese are good. And yes, it’s hard to mess up making a panini. But the ones at Brew Bakers are special. I’ve always thought it was elitist and ridiculous when people say things like “you can tell it’s fresh,” but I guess I have to learn that I’m wrong sometimes, too. I had literally never said that phrase about any restaurant experience before I went to Brew. But you can tell it’s fresh, darn it! The vegetables are so crisp and full of flavor that you’ll be horribly disappointed the next time you eat somewhere else. Eating the portobello mushroom panini ruined my own cooking for me for a while, because I could never reach that same level of beautiful taste that I got at Brew. I don’t know how they do it. Do they grow them right in the kitchen? Please tell me the secret if you find out. The eggplant is cooked to tender perfection, and I’m told that the chicken is never dry or bland. The salads are good, but the sandwiches and wraps are better. And a pro tip: even if whatever you order doesn’t come with pesto mayo on it, do yourself a favor and ask for some. It’s just like the pesto mayo you’ve had before. But better. Everything at Brew is like something you’ve had before, but better. That’s the hot take I’m sticking with. I stand by it. Before you leave, be sure to get some dessert, either to eat outside on their patio or to take home with you and save for later. Most of the dessert I take with me doesn’t survive the walk home, though. Just a warning. I especially want to plug the Mississippi Mud Pie, if they have it, because that piece of chocolately goodness has yet to be beaten in my assessment of Middletown desserts. Despite all these assets, Brew tends to be a bit overpriced. Sticking with the panini or wrap menu is probably the best value for all of us college students, and if you’re like me, you’ll choose to skip dessert more often than not. Despite the higher price tag, this is still one of the best lunch spots in the surrounding area, and the perfect place to visit when you’re itching to eat off campus on a warm afternoon. Go pay Brew Bakers a visit, and if you’re feeling generous, I accept Mississippi Mud Pie donations at my room in High Rise.